The facade of this house is so narrow - only 4 metres - that you might walk by without ever laying your eyes on it. And that would be a terrible loss, because that’s all you can do. This marvellous Art Nouveau facade was built by Horta’s student Gustave Strauven for painter Leonard St-Cyr in 1903. It stands out even among the city’s other terrific Art Nouveau offerings thanks to its haunted appearance, a twisted and tortured looking lattice of green wrought iron. Every other element of the building seems just ever so slightly out of shape too. It’s almost unsettling to look at, but undeniably striking. This building is awesome and trippy and I am glad we took a detour to check it out. It was really good to see. 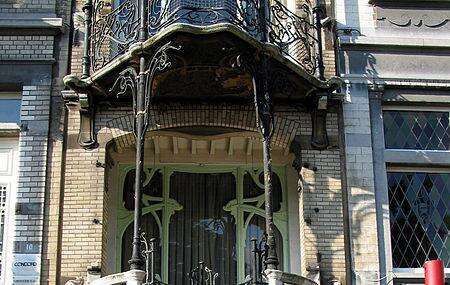 Exceptional Art Nouveau house. Can't be visited inside for the time being, but the façade is its most unique element.